Steak & Brew, Inc.’s predecessor owned an Illinois trademark registration on STEAK & BREW and operated a restaurant under the STEAK & BREW mark in Peoria, Illinois up to the fall of 1971. In April of 1971, Beef & Brew Restaurant, Inc. opened a restaurant under the name BEEF & BREW in Rock Island, Illinois. 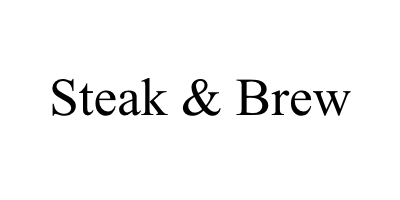 Steak & Brew sued Beef & Brew alleging Beef & Brew infringed its Illinois State trademark registration, but lost in the case of Steak & Brew Inc. v. Beef & Brew Restaurant, Inc., 370 Supp. 1030 (S.D.Ill. 1974). Steak & Brew lost not because the word “Steak” is different from the word “Beef” in the respective marks. But it lost because of the counter-intuitive principle that an Illinois state trademark registration does not grant the registration owner exclusive rights to use the trademark throughout the entire state of Illinois. This is in contrast to a federal trademark registration, which does create a presumption of exclusive rights throughout the nation. Previously I discussed the case of Burger King of Florida Inc. v. Hoots, 403 F. 2d 904 (7th Cir. 1968), which demonstrated that an Illinois state trademark registrations is subordinate to a federal trademark registration. In the Burger King case, the Hoots were the first to use its Burger King mark in Illinois, but Hoots’ Illinois state trademark registration was essentially worthless against the Burger King of Florida’s federal trademark, even where that federal registration was obtained after Hoot’s started using the Burger King mark in Illinois. The court refused to accept the argument that the Hoots’ Illinois trademark registration entitled them to rights throughout the state when they were only using the mark in and around Mattoon, IL. The Illinois state registration will not insulate against claims of infringement made by the owner of a federal registration nor will it block third parties from moving into the state using your mark in areas of the state where you are not operating/selling. Therefore, the court stated that the Illinois trademark registration does not grant rights in geographic areas where you are not using the mark. This is counter-intuitive. One would think that an Illinois trademark registration would give the owner rights throughout the entire state, but it does not. At common law, a business obtains rights in the trademark simply by being the first to use the trademark in the business to identify goods or services in a particular geographic area. An Illinois state trademark registration only gives you the geographic scope of trademark protection that you would already obtain under the common law by simply using the trademark without registration. The trademark act effective in the Steak & Brew case is different from the current act in Illinois, but the result is the same. The current Illinois Trademark Registration and Protection Act (Illinois Trademark Act) provides a protection of common law rights: “Nothing in this Act shall adversely affect the rights or the enforcement of rights in marks acquired in good faith at any time at common law.” 765 ILCS 1036/80. The “at any time” language must mean rights acquired under the common law either before or after an Illinois registration is granted. Therefore, under the common law, the defendant Beef & Brew Restaurant would begin to build up rights in the BEEF & BREW mark simply by operating its restaurant under that name in Rock Island. As the plaintiff only operated far away in Peoria, its rights would not extend to Rock Island under the common law. This is true even though the plaintiff obtained its Illinois registration before the defendant began operating in Rock Island. The plaintiff’s Illinois state trademark registration could not be used to stop others in remote geographic areas within the state from using the same or similar mark for the same or similar services. The Illinois Trademark Act provides for an award of treble monetary damages in the case of willful trademark infringement, which is not available to unregistered marks under the federal Lanham Act. 765 ILCS 1036/70. However, it is often difficult to prove willfulness in a trademark infringement suit. And if litigation under the Illinois Trademark Act is similar to that under the Lanham Act, the statistical likelihood of obtaining an award of money damages at trial is low. An Illinois state trademark registration is inexpensive but provides few benefits. The state registration does not grant exclusivity within Illinois. And the state registration is subordinate to federal trademark registrations. Therefore if you’re interested in broad protection of your trademark you should consider filing a federal trademark application if your circumstances allow. Next PostNext Do I Need a Patent to Sell My Product or Service?